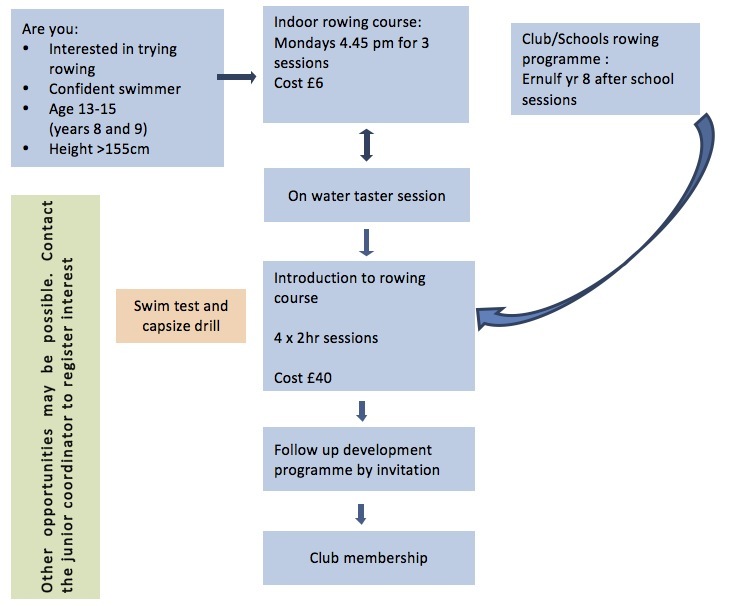 Our courses for juniors begin with a dry start course and on-water taster session before the learn to row stage. We are looking to expand our junior section of the rowing club in 2018 so will be registering interested juniors with a view to offering introduction to rowing courses at the club. We will be focussing on 13-15 age groups (years 8 and 9) but we may be open to other age groups depending on demand and our resources. Places for all courses will be limited so if you are interested don’t wait to contact the junior coordinator. Our proposed plans pending enough applicants will be something like the following. These sessions are aimed at learning the basic of good rowing technique using the indoor rowing machines (or ergos) and other land based exercises. We will also learn some basic terminology and take a look at some of the boats in the boathouse. There will be three sessions starting on Mondays at 4.45 – 5.45 pm at the rowing club starting second half of February. The cost of this initial course is £6. The taster session will be arranged in the second half of March and will include have a go at getting in and out of a boat and a go on the water. This course aims to give an experience of going on the water and practicing some of the basics that were learnt on the indoor rowing. There will be 4 sessions of about 2hrs – dates will be advised to interested individuals. The cost of the course is £40 to include a useful handbook of technique and terms. Rowers must be able to swim (100m continuously) and confident in the water such that that they will not panic if they fall in. They must be agile enough to get in and out of a small boat. Learners should expect to attend a swim test and capsize drill in the local swimming pool. What happens if the weather or water conditions are bad? Rowing is an outdoor sport and we need to take a safety first approach so it does happen that the weather is not suitable for beginners – too windy or the water is flowing too fast. In these circumstances we will do some alternative land based activity that will be helpful. Sometimes we can organise catch up sessions if the opportunities for on water experience are significantly curtailed by the conditions. We also ask that juniors are tall enough (more than 155cm) – this is to ensure that they are able to use the boats that we have in a way that allows for good technique. Rowing does favours tall athletes (long levers) and anyone very tall and ambitious to become an Olympic rower should look at the British Rowing Start programme. Rowing has many aspects – all of which are important in learning to row. Good technique is vital to a long and successful rowing experience and will be the main focus along with safety in the early days. Fitness, flexibility, posture and core strength underpin the ability to move a boat well. The learning will be in line with guidance from British Rowing. If you are going to have to miss a lot of sessions then it is hard for us to organise and hard for you to learn so we do ask that you bear this in mind before starting. Try and wear something relatively tight fitting. Excessively baggy kit can tend to get caught in the moving parts of the boat. Make sure you have a waterproof as we do train if it is raining. Probably, but not very. You are unlikely to fall in but you will get splashed a bit. It also rains in England. You will never know unless you try! Rowing is both an individual and team sport which does not require a high degree of hand eye coordination. Experience suggests that with practice, persistence, hard work most can master the basics of the rowing stroke. After completion of the Introduction to rowing course we will arrange a follow on programme and invite those who are keen to continue and who we feel will benefit from the course. This is likely to include Sunday afternoon sessions. Who will be helping me learn to row? The programme will be under the direction of British Rowing qualified coaches who will be assisted by competent rowers either seniors or juniors. Coaches at the club are volunteers who give their time and expertise to help people learn. Please also indicate if there are any circumstances (e.g. medical conditions) that we might need to know about. This would also be the first point of contact if you have any queries or need any additional information. Places on the courses will be confirmed by email, together with any further information and instructions regarding payment etc. A parent signed application form will be required. Other information about the club? Want to sign-up for the next course? Please email your details with our Junior coordinator and we’ll be in touch to let you know if you been successful.